We found a use for all those pesky rules and regulations. 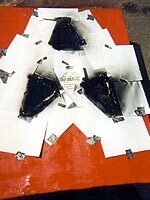 The Goat Brothers went to San Francisco to compete in Comedy Central's third season of Battlebots, which will begin airing 10 July, 2001. The good news is there was a nice Thai restaurant next to the hotel. As far as Goat Hammer went... well he wasn't the lamest bot there, although he might have looked it. Some robots failed to motivate sufficiently to vacate their colored starting square. Goat Hammer proudly, if awkwardly, drove from one end of the Battlebox to the other. Unfortunately, that was not enough to get us to the playoffs. 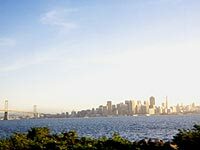 View of civilization from Treasure Island, which after a few days made you wish for the luxuries afforded inmates at Alcatraz. During the final hours of preparation it became clear to senior Goat Brother, Tim, who single handedly conceived and constructed Goat Hammer, that his robot was too damn heavy. An emergency weight reduction program (or perhaps in this case, pogrom) had to be initiated, which left little of the original Goat intact. The drive train and the metal frame it resided in were all that survived the winnowing process. The pry bar spikes, the wedge, and the armor coating were all sacrificed to enable the mighty Goat Hammer to just barely meet the 115lb middle weight requirement. 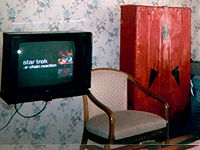 Here's Goat Hammer, after his round one defeat, relaxing with his crew, and the crew of the Enterprise during a classic Star Trek Chain Reaction. Even if Tim had not miscalulated Goat Hammer's final weight, he would have had his hands full fending off some of the bots entered by the ubergeeks in attendance. Treasure Island was the site of a stupefying gathering of robot fanatics. It reminded us of those long lost days at Hunt Valley amongst fellow Trekkers, only these guys were power welding jalopies which could toss three hundred pound weights ten feet into the air. 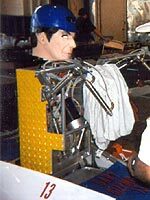 The logical choice for favorite robot was Gary Gizmo, who we shared pit space with. I don't know whether I'd describe those facial features as fascinating, but they are -- interesting. We learned a lot and had some fun, and have Battlebot war stories we can tell my grandkids, like how the port-o-pots got so heinous by the end that they violated articles of the Geneva Convention. 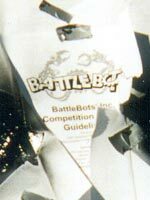 Ahh those were good times.....for more information see www.battlebots.com or www.robotcombat.com.